Mitch Clements Ltd. is Tauranga-based general contractor using Hitachi’s ZAXIS135USK, a 13 ton class short tail swing excavator with K-series features such as heavier counterweight, attachment piping, overhead/lower glass guard, and truck undercover. The customer also owns an EX225USRLC-5, and has an ZAXIS225USRLC on order as of March 2004. Value for money, good recognized and reliable brand. Very reliable machines with state-of-the-art technology, the most popular brand in New Zealand. Owner expects high trade-in value after 3-5 years. Good nationwide service & Parts support by CablePrice. Excellent features with short radius giving versatility. K cab features are excellent giving good visibility. Use of a blade has improved versatility. The best machine for the construction/road/drainage work in narrow city spaces. This is 2nd ZAXIS135US delivered in New Zealand. 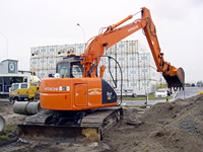 Many of our customers in New Zealand recognize the advantages of the short tail excavator and want to have them as their fleet. Also, we have been promoting the unique “K” model in our market, whose features suit to the Kiwis popular Quick hitches, and heavier front attachments. Company Name: Mitch Clements Ltd.